TAIL TROUBLE Salamanders such as the axolotl (above) can regrow nearly perfect tails, including missing nerve cells. Lizards such as the green anole (below) can't. Salamanders and lizards can both regrow their tails, but not to equal perfection. While a regenerated salamander tail closely mimics the original, bone and all, a lizard's replacement is filled with cartilage and lacks nerve cells. That contrast is due to differences between stem cells in the animals' spinal cords, researchers report online August 13 in Proceedings of the National Academy of Sciences. When a salamander loses its tail, neural stem cells in the creature's spinal cord can develop into any type of nervous system cell, including nerve cells, or neurons. But through evolution, lizard neural stem cells "have lost this ability," says study coauthor Thomas Lozito, a biologist at the University of Pittsburgh. Lizards, while they can regrow cartilage and skin, cannot regenerate neurons, the researchers found. 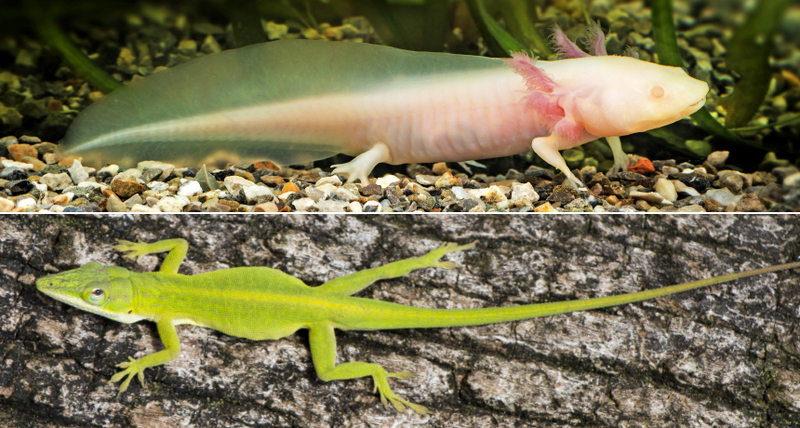 Lozito and colleagues studied neural stem cells from the axolotl salamander (Ambystoma mexicanum) and from two lizard species - the green anole (Anolis carolinensis) and the mourning gecko (Lepidodactylus lugubris). The team also wondered if the lizard stem cells themselves weren't capable of developing into neurons or if there was something about the environment of the lizard tail that prevented their regrowth. So the researchers implanted salamander neural stem cells into five gecko tail stumps. Some of the cells became neurons in the regrown tails, showing that the lizard stem cells were the problem. The finding suggests that scientists would have to alter only the lizard stem cells instead of other parts of the tail to regrow a more complete appendage. How lizards lost their ability to regenerate neurons and salamanders didn't remains a mystery (SN: 11/28/15, p. 12). Scientists know that species' places on the evolutionary tree have something to do with organisms' ability to regrow body parts. "The more complex the species are, the less they can regenerate," says developmental biologist Katharina Lust of the Research Institute of Molecular Pathology in Vienna, who was not involved in the study. Reptiles such as lizards are more complex organisms than amphibians like salamanders. The researchers plan to use CRISPR/Cas9 gene editing to see if lizard neural stem cells can be modified to regenerate a perfect tail. Ultimately, the team hopes to one day coax stem cells in mammals to regenerate body parts. "My goal is to make the first mouse that can regenerate its tail," Lozito says. "We're kind of using lizards as a stepping-stone."